Madeira is the most beautiful and magical place to host your wedding, with stunning views, amazing scenery and dramatic mountains, what better back drop to make your commitment to the one you love. Just a short flight from the UK and other european countries, it is becoming a popular choice for couples who want a destination wedding that they can celebrate with all their favourite friends and family. It is also a very popular for elopement ceremonies, where it is just the two of you. Originally from the UK, I trained as Wedding Celebrant, and moved to the Algarve to conduct wedding ceremonies. 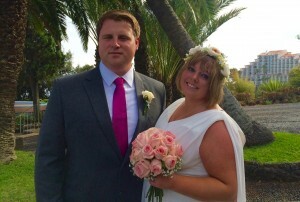 I am now living in Madeira and have expanded my business to assist and support couples to plan their perfect day. Whether you choose to hold your wedding ceremony on the coast, at a villa, in a hotel or any other venue, I will ensure that the event is planned to perfection, so that you hold this special day in your hearts forever. There are lots of elements to the day that I can assist you with. If you would like I can plan the whole event, locating a suitable venue and organising all the suppliers, including flowers, music and catering. This takes away all your stress of organising a wedding from abroad, so you can just arrive and enjoy. If you would like to be more involved in your planning, I offer a Co-ordination Service which means that you organise everything you require but on the day I am there to ensure your plans run smoothly. This can involve organising the table plans, decorations, flowers and assisting the other suppliers to know where they are needed, and organising the payments for suppliers. In effect, I become you for the day, allowing you to enjoy all the hard work you have done creating the perfect event. As a Wedding Celebrant, you may like to use my services just to write and conduct your Ceremony. I can design you a ceremony that reflects all your personal hopes and dreams. I am also able to assist you with the paperwork and organise a Portuguese Registrar to conduct your ceremony for you. There is lots of information about this on the Ceremony Page. A wedding in Madeira is never just a one day event and so I am also available to assist in organising tours, such as dolphin trips or a visit to the famous botanical gardens. Here is a video of a Wedding I both planned and conducted the ceremony for. The video was made by a fabulous team from No Words Productions.